Vidalia, Georgia is best known as the home of the Vidalia onion, which grows in the low-sulfur soil found around the town. While the sweet onion was discovered in 1931, it was not until after World War II that it came to dominate the area’s agriculture. With the help of a national marketing campaigning and the Piggly Wiggly chain of supermarkets, this former railroad junction in southeast Georgia has become permanently associated with the Vidalia onion. But long before the rise of the famous onion, Vidalia was a regional center for the area’s tobacco, cotton, and peanut crops. The town was founded in 1891 when the Savannah, Americus, and Montgomery Railroad came to the area. Vidalia didn’t blossom until a second railroad was built into town, making the town a regional railroad junction. What had been a small town of 500 people in 190 grew to a bustling trading center of 3,500 by 1917. While railroad cars and the produce they carried lifted the town’s fortunes, the same railroad also brought a small number of Jewish immigrants, who sought to benefit from the town’s tremendous growth. These immigrants began a community that, though small, remains today. ​Among the first was Aaron Rosansky and his brother-in-law Moses Leader. Both were immigrants from Poland who had met in Augusta, Georgia. In 1894, they moved to Vidalia and opened a general store which eventually grew into the largest store in the area. According to an article in the 1917 city directory, “the magnificent department store of Leader & Rosansky is one of the largest and best equipped in this section of the state.” The store sold a wide array of goods, from clothing and home furnishings to mules and wire fencing. Later, the store even had a self-service grocery department. When the store had a grand re-opening one day in 1922, it employed 100 clerks for the event and gave away 3,912 bottles of Chero-Cola to customers. Leader & Rosansky’s new store was not long-lived; the retiring owners closed the store in 1928 since they had no family members interested in continuing it. By 1920, there were a handful of Jews living in Vidalia, most making their living in the retail business. This included the Hackel brothers, two of whom owned a dry goods store, and another two owned a junk business. The Hackel Brothers Store, which sold “high art clothing” along with shoes and hats proclaimed in ads that they were “the store of small profits.” Joseph Hackel was the first brother to emigrate from Russia, arriving in the U.S. in 1901. He and his wife Rosa, who was also a Russian immigrant, were living in Georgia by 1911. Hackel’s brothers soon came to join him in Vidalia. By 1929, the extended Hackel family had moved to Jacksonville, Florida, selling their dry goods store to another Jewish family that would become a pillar of the local Jewish community for the next 80 years, the Estroffs. In 1925, Max and Fannie Smith came to Vidalia and opened a shoe repair and shoe store. Later, they opened Max Smith’s Department Store. 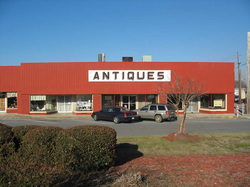 Son Ben Smith took over the store from his parents and ran it with his sister, Doris Smith Foskey until the late 1980s, when it closed. For much of the 20th century Estroff’s and Max Smith’s stood across Main Street from each other, anchoring Vidalia’s downtown business district. Both families became leaders of the local business community and were active in civic affairs. Both Hyman and his son Donald Estroff won the citizen of the year award given by the local Kiwanis Club. Ben Smith won this honor as well. But when new shopping centers and a mall diverted their customers from downtown, the two stores were unable to survive. Several other Jewish-owned stores in Vidalia have closed during the last few decades, including Bailey’s Department Store and Seymour’s Ladies Clothing Store. Vidalia’s Jewish community was not exclusively centered in retail business. After World War II, a handful of Jewish manufacturers from the northeast came to the South in search of cheaper labor, which they found in Vidalia. Murray Olewitz brought his Globe Manufacturing Company to Vidalia and sent his son Joel to run it. New Yorker Louis Ratner opened the Hazelhurst Manufacturing Company in Vidalia and Hazelhurst, Georgia. His son Allan Ratner moved to Vidalia to run the local plant. The business with the largest impact on the Vidalia Jewish community was Rosebud Manufacturing. This lingerie factory was owned by David Grossman, who lived in New York. 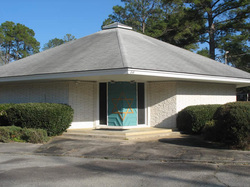 Grossman, who was close friends with local community leader Ben Smith, agreed to build a synagogue for the small number of Jews in Vidalia in 1969. The Jews of Vidalia had always worshiped in either Macon or Savannah, their numbers not sufficient to support a full-time congregation. 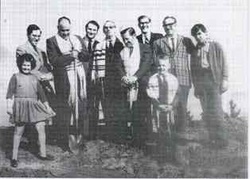 In 1937, only 23 Jews lived in Vidalia, but in 1964, with the recent influx of Jewish manufacturers from the North, Vidalia Jews finally organized a congregation, Beth Israel. Hyman Estroff was the first president, while Ben Smith was the vice president. One of the group’s first actions was to establish a religious school, which was run by a group of women in the congregation: Anita Estroff, Sylvia Brown, Phyllis Levine, and Bebe Smith. The congregation used a local Women’s Club building for both services and the religious school. In their early years, Rabbi Nathan Kohen of the Fitzgerald Hebrew Congregation would come once a month to lead services. When he was no longer able to continue serving Beth Israel, the congregation was informally adopted by B’nai Brith Jacob in Savannah. Their rabbi, A.I. Rosenberg, assigned one of the congregation’s young rabbis, Borach Taub, to work with the members of Beth Israel. When Rabbi Taub moved to New York, the Savannah congregation continued to send young rabbis to help Beth Israel. They would tutor children preparing for bar mitzvah ceremonies and lead adult education classes. With the assistance of David Grossman, Beth Israel, which had 14 member households, dedicated its synagogue, a small, star-shaped building, in 1969. After the dedication, the congregation hosted a banquet in honor of Grossman, at which Vidalia mayor Hugh Dixon praised the work and progress of Beth Israel. The congregation acquired a Torah that survived the Holocaust, one of 1,564 such Torah scrolls that came to the Westminster Synagogue in London in 1964. Torah Scroll MST#453 from the town of Mlada Boleslav, is on loan from the Memorial Scrolls Trust. Today, Beth Israel still uses this Torah, the only scroll which sits in its ark. What makes Beth Israel unique when compared to other small town Southern congregations is its long adherence to Orthodox Judaism. Vidalia’s Jewish community was founded by Eastern European Jews who worked to maintain traditional religious practices in their worship, even as they had to compromise in their daily lives. Store owners had to keep their businesses open on Saturdays, and kosher meat could be difficult to find. Some Jews got meat from Savannah and maintained kosher homes. Most drove to shul, rather than walking. Despite these difficulties, many Vidalia Jews belonged to the Orthodox B’nai B’rith Jacob congregation in Savannah, and once the historic Savannah shul began to serve Beth Israel, the congregation was further drawn to Orthodoxy. Many Beth Israel members also belonged to B'nai Brith Jacob, worshiping there on the High Holidays. Jewish merchants closed their stores for two days on Rosh Hashanah, as is the practice for Conservative and Orthodox Jews. Ben Smith was the longtime president of the congregation and worked to maintain its Orthodoxy. 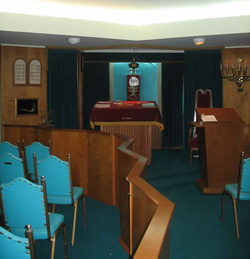 Beth Israel has a mechitzah, a wooden partition which bisects the tiny sanctuary, separating male and female worshipers, in accordance with Orthodox tradition. The reading desk, where the service leader stands, faces the ark rather than the congregation. The small kitchen is kosher and contains detailed instructions on the proper handling of food, pots, and dishes. The synagogue maintains its allegiance to Orthodox Judaism out of a sense of tradition. In recent years, the congregation has brought in an Orthodox rabbi from Atlanta to lead services on Yom Kippur. Finding ten men to make the minyan is challenge, and the congregation's president starts trying to round up male worshipers several months in advance. Recently, in an effort to increase more regular participation, the congregation has agreed to allow optional mixed-gender seating for regular Friday night services. in keeping with Orthodox tradition. As of 2016, Beth Israel in Vidalia continues to be an active community. With a dozen member units, they hold Conservative-leaning services twice a month, primarily lay-led although Rabbi Haas from Mickve Israel in Savannah (Reform) occasionally comes to lead services. They own their building, but have little money to spend on bringing in rabbi. Once a month, the congregation hosts an oneg reception after services. While Beth Israel remains vibrant, its future is in doubt. A few Jewish doctors have moved to Vidalia in recent years, but most of them have not stayed in the town for long. The remaining Jewish population is aging, and all of their children have moved away to bigger cities like Atlanta, which offer greater economic and Jewish opportunities. But as the history of Vidalia’s Jewish community has shown, it did not take much more than a minyan to build and maintain an active Orthodox congregation for the last 40 years, and despite small numbers their community still gathers and celebrates Judaism in their small town.